An admiral of the fleet or fleet admiral (sometimes also known as admiral of the navy or grand admiral) is a military naval officer of the highest rank. In many nations the rank is reserved for wartime or ceremonial appointments. It is usually a rank above admiral (which is now usually the highest rank in peace-time for officers in active service), and is often held by the most senior admiral of an entire naval service. 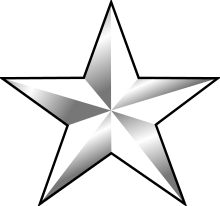 The rank also exists or has existed (on paper at least) in Bangladesh, Indonesia, Nigeria, Oman and Pakistan, although not all of these countries have actually ever bestowed the rank on an individual. ↑ In some navies, however, such as the German Kriegsmarine during World War II, "admiral of the navy" has been considered a higher rank than "admiral of the fleet" or its equivalent.